But now? Now I have something I never thought could exist in a hopeless wreck like me, and that is hope. I. Me. Theresa. Is in Recovery and has been sober for over four months! Well slap my thigh and call me Norman!!! Haha! I am dry! Thank you everyone who never gave up on me and shared the hope that I could finally begin to beat those wicked, mean demons of mine!! I referred myself to a drinks counsellor over two years ago, even though I had known I had a drink problem from the age of 18 (it was in fact a problem from the age of 15, it just never occurred to me then). I went a couple of times, but did not see how ‘talking’ was going to help me to control myself whilst drinking. Over the years, I had gotten myself into all kinds of trouble – fighting, getting arrested, finding myself in dangerous situations with people who would take advantage. And waking up countless times with no idea how I had come to be where I was or what I had done. I married at 22 to an alcoholic 18 years my senior and found this an extremely dangerous situation. Five weeks after the marriage I found myself in hospital with multiple breaks to the face. Would this have happened had we both not been alcoholic? I will never know. I came out of hospital unable to consume anything but liquids and painkillers… great! I started drinking in the mornings, washing my painkillers down with neat vodka and locking myself away thinking that this tragedy was the perfect excuse for getting wrecked. I could go on to explain everything that gave me the excuse to drink to oblivion, but there is not the space and it is a common story that millions will know. Instead, I will try and explain how bad it got towards the end of my drinking and how I came (by some miracle) to stop. As I said earlier, things were bad enough for me two years ago to seek help, though things had to get way worse before I could admit defeat. I had been to my doctor on countless occasions, and been given librium to detox at home, but with this I could never succeed more than a day or two. I had a daughter when I was married and I was struggling by this time to care for her on my own. But I kept going. Trying to drink just enough through the day to keep the withdrawals away. Then, when she was in bed, I would continue to get hammered. I would do this alone, or if I was with someone at the time who was like me, we would do this together. As time went on, I lived for the evenings when I could just lose myself in the haze. My counsellor managed to get me a bed in a detox clinic at the beginning of last year, and I really believed this was the thing that would cure me. I packed my bags and left my child with my mother – which was heart-breaking for us both as we had never been apart – and managed to last 16 days in the unit. 16 days! That was the longest I had ever gone without a drink in 13 years. The night I came out I was pissed again. By last spring, I had taken my daughter and myself away from my family and hid away, thinking that this time I would dry out and stay dry. This never happened. I was given librium again, but I was so completely saturated in alcohol I could not do this alone. I had not been thinking straight for months, was completely distraught, and every ounce of self-worth had dried up a long time ago. I took an overdose. A friend found me and called an ambulance and took care of my daughter while I was in hospital. I made my way home the next day and found social workers at my door. I had stopped off to get a bottle on my way home and was drunk. The two social workers were very kind to me, but told me that I was in no state to be caring for a three year old. They took her from my care and placed her with my mother whom I now had not seen for several months. I was completely and utterly heartbroken and could not pick myself up off the floor. I was devastated. I continued to get as drunk as I could, as I did not know how to cope with this pain. I had been steadily working my way through two bottles of vodka a day and I did not know how to stop. I was moved to a one-bedroom flat that I could not afford to furnish properly – I had a bed and some tables – and continued to drink there. I was missing my baby so much it physically hurt; imagining her feeling the same was horrendous. But I could not stop. Over the next few months, I ended up in hospital with alcoholic fits, steadied, then sent home to continue. I so much wanted to stop, but by this time I was petrified. My doctor could not give me any Librium, as I was a danger to myself, and he told me to try and reduce my drinking until they could get me a bed in detox. I was passed reducing. I waited and waited for a call to say I had a bed on a detox ward, but none came. I was not there for my baby’s fourth birthday. I missed her first day at school. Would she forget me? It may have appeared to some that I was shirking my responsibilities in order to party, but I was not. I was living in a sparse flat, dragging myself out of bed each day to drag myself to the off licence and drag myself back again. I was floored. I was beat. I was going to die. I was outside my flat one day, on a bench, wasted. An older man approached me. He was a resident in my block of flats. He was also a member of AA. He took me to a meeting every Thursday, which I attended drunk. My new friend had been sober for 28 years. He spent hours talking to me, at all hours of the day or night. I woke up one morning and just tipped my booze down the sink. I was in no state to go and get more, so I put myself back to bed and waited for the hell which was to follow. And hell it was. Sweating, shaking, hallucinations, paranoia, nausea, muscle cramps and insomnia. But I did it. Four weeks later, I had rented a house and my daughter came back to stay. One week after that and she was gone again. I had drank. I moved into my parents’ house and vowed not to drink again. Then Christmas came and I can’t remember anything from Christmas day until the 7th January. I came to in my parents’ house, with no idea how I had got there. I had slashes up my arms and had been in hospital again with a suspected overdose. And this bender had been long enough for me to have to endure terrible DT’s again, and they were just as bad as the last time. I was so scared and confused. How had this happened again? This was no joke, I was going to die and leave my daughter behind if I did not leave drink alone. So I have, and I have meant it this time. This is the hardest thing I have ever done. The first two months were hell to be honest. I did not think I could do it. But very slowly, I have been emerging from my fermented chrysalis cage, and am standing on the rim drying my wings. 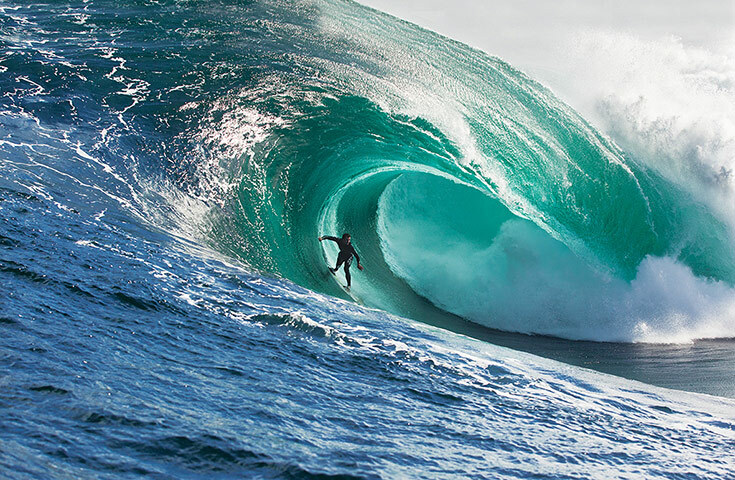 This photograph by Spencer Hornby is from a collection of surfing photos from The Guardian.